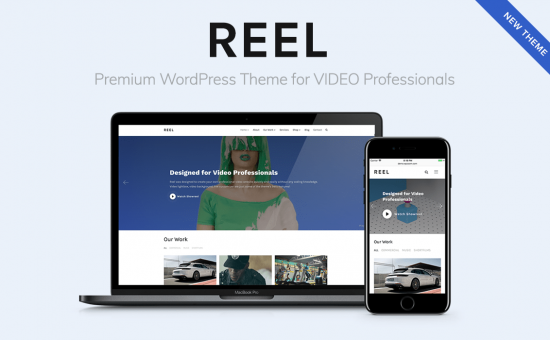 Reel is another great responsive WordPress video theme from WPzoom developer club. This theme is specially designed to use for video professionals to showcase their daily videos and digital presence to the world. You can build a video website without any coding knowledge by using a simple drag and drop page builder. Reel WordPress Theme is coming with lots of features to showcase your videos and display in some professional ways, such as video lightbox, video background, YouTube and self-hosted supported slides on homepage featured section, all you need to do is, simply enter the YouTube or Vimeo video URL to display the videos. Reel WordPress Theme is also fully supported and integrated to drag and drop page builder, which is allowing you to build the pages using the content and media shortcodes. There are also pre-made templates to use directly from the admin panel options. Showcase the videos in 2, 3 and 4 columns using portfolio templates. Additionally, it is compatible with popular e-commerce plugin called WooCommerce to showcase and sell your product online. Generally, Reel theme can be used to promote your personal videos, videography, travel videos, regular business or digital marketing, social media and Internet marketing related websites. The theme is very simple yet you may be needed minimum WordPress knowledge to install and use it. If you additionally need help to install and customize, you can directly contact the theme developer on the license period. Check out the features of the reel theme below. Responsive web design and mobile ready! Sticky Header, Infinite scroll and etc.